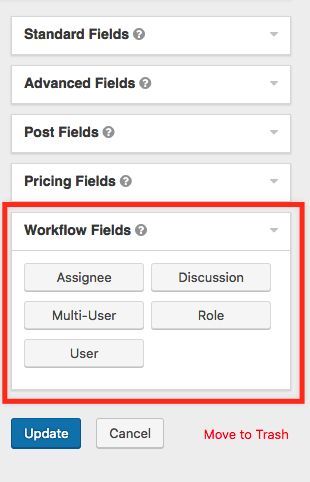 When you add a Workflow Field to the form you can use it in the configuration of a Workflow step. For example, you can assign a step to the select user in the User Field. Or send an approval email to all the users in the role selected in the Role field. The User Field is a Drop Down field that displays a list of all the WordPress User account on your site. The User Field supports conditional logic so you can show or hide other fields based on the value selected in the User Field. It has the same options as a Drop Down Field. The Multi-User field works like the standard Multi-Select field and shares the same options as the single User field. It allows multiple users to be selected from the list of users. The Multi-User fields can be selected as an assignee in the step settings and the selected users as treated as if they were selected in the step settings. This means that the assignee policy applies to all the selected users. So, if the assignee policy is set to "all assignees must complete the step" then all the users selected in the Multi-User field must complete the step in addition to any other assignees selected in the step settings. 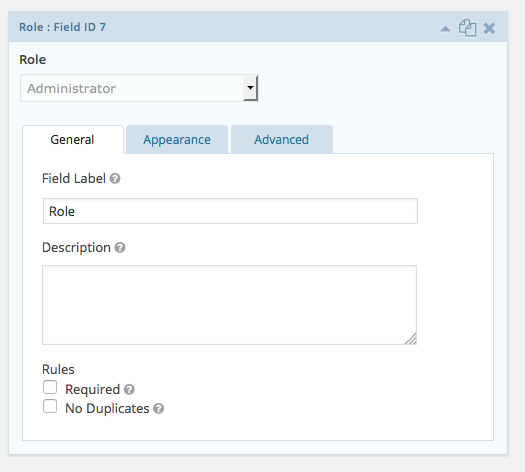 The Role Field is a Drop Down field that displays a list of all the WordPress Roles on your site. The Role Field supports conditional logic so you can show or hide other fields based on the value selected in the Role Field. It has the same options as a Drop Down Field. 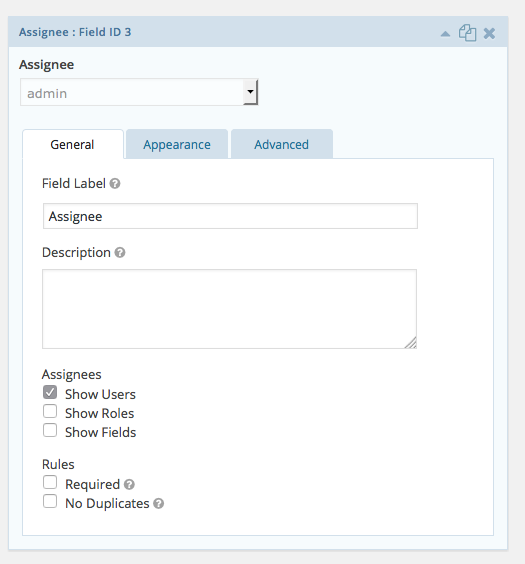 The Assignee Field is an advanced workflow field that can be added to a Gravity Form and can be used to allow users to choose between users, roles and other Assignee fields. The Assignee Field does not support conditional logic but it can be very useful in custom development where you may want to offer different types of assignees. IMPORTANT: before using this field, check if you can use the User Field or Role Field which were added in version 1.1.2. 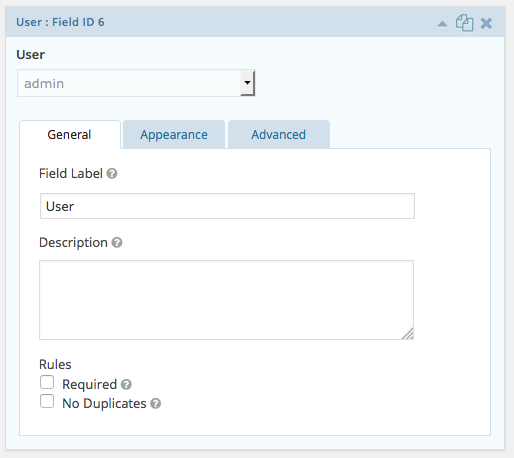 The User and Role fields support conditional logic whereas the the Assignee Field supports multiple assignee types. When you add it to the form it will look like a standard dropdown field but it will have all the WordPress Users and Roles in the list ready to be selected. After you've added the Workflow Field to the form you'll need to use it in the configuration of a Workflow Step. 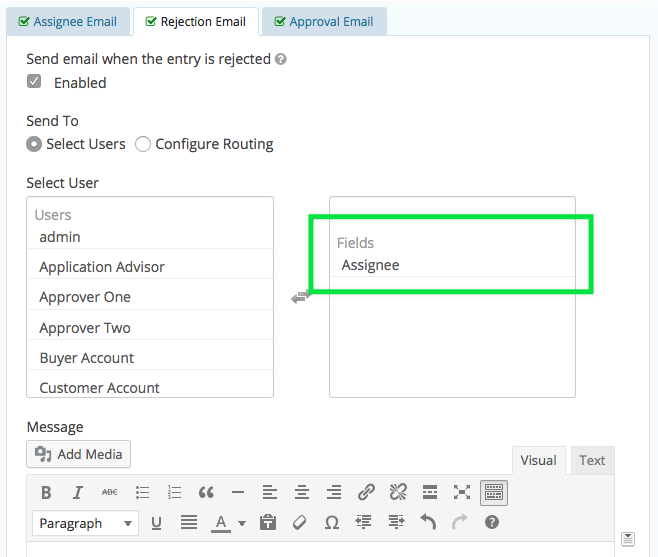 For example, assign an approval step to the user selected in the Assignee Field. You can also select the Assignee Field for the destination of the approval and rejection emails.